Lewis George Howe was born on 20 May 1835 at Canada. Lewis George Howe married Mary Ann O'Connor on 12 July 1872. Lewis George Howe died on 22 December 1894 at Iowa at age 59. Married Name 12 July 1872 As of 12 July 1872,her married name was Howe. Mary Ann O'Connor was born in September 1850 at Wisconsin. She married Lewis George Howe, son of Squire Howe and Lucina Humphrey, on 12 July 1872. Mary Ann O'Connor died on 23 May 1928 at Iowa at age 77. Ella M. Bly married Albert A. Howe, son of Squire Howe and Lucina Humphrey. Ella M. Bly was born in May 1855 at Illinois. Edward Howe was born circa 1878 at Iowa. He was the son of Albert A. Howe and Ella M. Bly. Daniel Stoddard was born at Connecticut. He was the son of (?) Stoddard. Daniel Stoddard, also a native of Connecticut, came from New York in 1854 and settled on section 30. He was an old batchelor and by profession a school teacher. He died in February, 1868. His widow still occupies the homestead. Daniel Stoddard migrated at Richland, Wisconsin, from New York. Josiah Edwards died at Michigan. He married Emeline Stoddard, daughter of Valentine Stoddard and Joanna Davison. Jesse Stoddard was the son of Valentine Stoddard and Joanna Davison. Harley Martin married Georgia Stoddard, daughter of Harlow Franklin Stoddard and Anna J. Reagles. Married Name 7 June 1898 As of 7 June 1898,her married name was Butts. 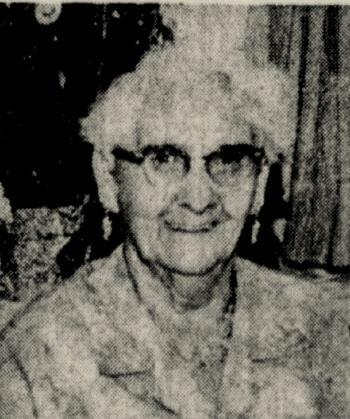 Lillian Loraine Stoddard was born on 7 April 1875. She was the daughter of John Washington Stoddard and Susan Catherine Johnson. Lillian Loraine Stoddard married George Robert Butts on 7 June 1898. Lillian Loraine Stoddard died on 24 February 1932 at age 56. George Robert Butts was born in 1860. He married Isabel Short on 21 April 1887. George Robert Butts married Lillian Loraine Stoddard, daughter of John Washington Stoddard and Susan Catherine Johnson, on 7 June 1898. George Robert Butts died in 1940. Married Name 21 April 1887 As of 21 April 1887,her married name was Butts. Isabel Short married George Robert Butts on 21 April 1887. Leah Butts was born on 25 October 1899. She was the daughter of George Robert Butts and Lillian Loraine Stoddard. Leah Butts died on 9 December 1903 at age 4. Pansy Butts was born on 15 July 1902. Pansy Butts died on 12 January 1909 at age 6. Name Variation Agnes Bertha Sullivan was also known as Bertha. Married Name circa 1897 As of circa 1897,her married name was Green. Agnes Bertha Sullivan was born in September 1873 at New York also reported as 1872. Agnes Bertha Sullivan married Harry M. Green, son of (?) Green, circa 1897. Agnes Bertha Sullivan died on 2 May 1909 at Nashua, Hillsborough, New Hampshire, at age 35. Agnes Bertha Sullivan had zero in June 1900 children. [S245] U.S. Federal Census 1900 U.S. Federal Census, by Ancestry.com, Year: 1900; Census Place: Nashua Ward 9, Hillsborough, New Hampshire; Roll T623_948; Page: 12B; Enumeration District: 129. Name Variation Harry M. Green was also known as H. M.
Harry M. Green was born in 1870 at New Hampshire also reported as Jan 1875. He was the son of (?) Green. Harry M. Green married Agnes Bertha Sullivan, daughter of Michael Sullivan and Susan O. Judge, circa 1897. Harry M. Green was a shoemaker in 1906 at Nashua, Hillsborough, New Hampshire. William Green was born in May 1875 at New York. Charles H. Green was born in April 1880 at New York. Married Name Her married name was Duckett. Name Variation Mame Teel was also known as Mamie. Mame Teel married Fred Duckett. Mame Teel was born on 3 June 1881 at twin with Amy, Whitman, Washington. She was the daughter of David Wilson Teel Jr. and Sarah Elma McCormick. Mame Teel died after June 1971. 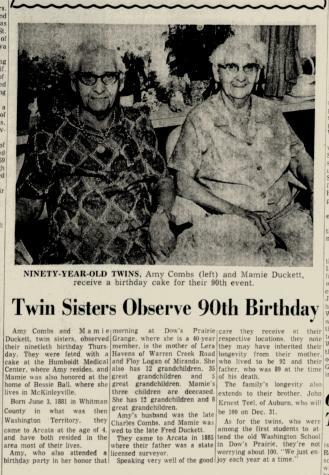 In June 1971 Twins celebrate 90th birthday Amy and Mamie Teel. (?) Longstreet married Gwendolyn Emily Chiever, daughter of George Francis Chiever and Lydia Elizabeth Vest, before 1939. George Vest was born circa 1873 at Kentucky. He married unknown (?) before 1892. George Vest died after 1930. [S250] U.S. Federal Census 1930 U.S. Federal Census, by Ancestry.com, Year: 1930; Census Place: Precinct 7, Wharton, Texas; Roll 2408; Page: 9B; Enumeration District: 24; Image: 628.0. [S373] U.S. Federal Census 1940 U.S. Federal Census, by Ancestry.com, Year: 1940; Census Place: , Wharton, Texas; Roll: T627_4161; Page: 2A; Enumeration District: 241-24. Married Name before 1892 As of before 1892,her married name was Vest. Unknown (?) was born before 1880 at Indiana. She married George Vest before 1892. Arbery Wayne Vernon was born on 25 March 1948 at Wharton, Texas. He was the son of Emanuel Lee Vernon and Gwendolyn Emily Chiever. Arbery Wayne Vernon died on 21 August 2010 at age 62. Arbery Wayne Vernon obtained US Social Security Card at Texas; last residence Rock Island, Colorado, Texas. Robert H. Bagley was born on 27 August 1935 at Oregon. He died on 5 February 2004 at age 68 A memorial service will be at 10 a.m. Tuesday, Feb. 10, 2004, in Portland Memorial Funeral Home for Robert H. Bagley, who died Feb. 5 at age 68. Mr. Bagley was born Aug. 27, 1935, in Eugene. He served in the Army National Guard and graduated from Oregon State University. He owned two 7-Eleven stores and had lived in the Portland area for 44 years. In 1960, he married Darlene Rands. Survivors include his wife; daughter, Lisa; son, Bruce; and one grandchild. Remembrances to the Oregon chapter of the Alzheimer's Association. George Henry Anderton was born on 30 June 1899 at Iowa. He married Mabel Joy Rands, daughter of Richard Rands and Carrie Christine Mollet, on 19 September 1924 at Marion, Oregon. George Henry Anderton died on 2 November 1937 at Portland, Oregon, at age 38. Benjamin Sargent died at Maine. He was born on 2 September 1763. He married Olive Bodwell, daughter of Henry Bodwell, on 28 December 1786. Married Name 28 December 1786 As of 28 December 1786,her married name was Sargent. Olive Bodwell was born in 1767. She was the daughter of Henry Bodwell. Olive Bodwell married Benjamin Sargent on 28 December 1786. Olive Bodwell died in 1824 at Maine. Henry Bodwell was born in 1729. He was the son of Henry Bodwell. Henry Bodwell died in 1816. Henry Bodwell was born in 1688. He was the son of (?) Bodwell and unknown (?). Henry Bodwell died in 1773.